Keeping track of all of the different stitch functions on your sewing machine can seem overwhelming, but with our free Guide to Mastering Different Stitches, you won't ever have to worry about not knowing the difference between a blend hem and a blind hem. This free printable guide to machine stitches is perfect for beginners, and lists basic stitches, as well as satin, buttonhole, and edge stitches. This beginner sewing guide is an excellent choice for your teen or tween who is just learning how to sew and even comes in handy if you're working with a new machine. Make machine stitching quick and simple with this guide to mastering stitches. A really helpful infographic, thank you All Free Sewing! I have been using a sewing machine since I was a little girl and have made all sorts of things but there are stitches in the PDF download that I have never thought of using before. I have printed it and stuck it on the wall at my worktable! Thank you Allfreesewing for a great printout guide! 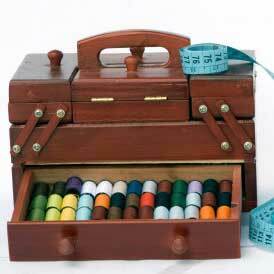 This is very helpful in sorting out all the different stitches and learning the proper names. Most of these stitches are the basic ones you will use the most, and I didn't know all the proper names of some of these stitches in spite of sewing for years! Very clear and informative.